YALSA Midwinter Mixer & Tech Playground â€“ In Second Life! By Beth Gallaway January 8, 2009 May 22, 2009 YALSA Info. 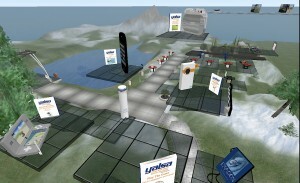 For those who won’t be attending the American Library Association’s Midwinter Meeting in Denver, Colorado, the Young Adult Library Services Association (YALSA) will recreate the YALSA Mixer and Tech Playground in the 3-D virtual world, Second Life. This interactive exhibit, which runs Jan. 9 through Jan. 31, 2009, features models of some of the gadgets being featured at the special event, which kicks off YALSA’s Teen Tech Weekâ„¢ and will be held Jan. 23 at the Hyatt Regency Denver, 8 â€“ 10 p.m. Gadgets are displayed on platforms at ALA Island (61, 228, 35). You may need to fly to see all the platforms! A menu with locations is in the large column at the entry point. Each gadget featured in SL includes an informational notecard with tips on incorporating the item into Teen Tech Week events. Teen Tech Week is a national initiative sponsored by YALSA and aimed at teens, their parents, educators and other concerned adults to ensure that teens are competent and ethical users of technologies, especially those that are offered through libraries such as DVDs, databases, audiobooks, and videogames. The 2009 theme for Teen Tech Week is Press Play @ your library’®. Teen Tech Week is March 8-14, 2009. MySpace Photo Shoot: Dress up your SL avatar, then take a snapshot. Upload it to Flickr or Snapzilla with the tag â€œphotoshoot.” Try editing the image with some of the graphics editors suggested, then upload it to your favorite social software application. Play The Game (You Lost the Game): The game is a big game, with 3 simple rules. More information at www.losethegame.com. Teen Tech Week People Scavenger Hunt: Collect notecards from SL avatars who have participated in certain events, such as creating an avatar, planning a Teen Tech Week program, listening to a podcast, commenting on a blog, and so on. The first SL avatar to turn in a TTW People Scavenger Hunt notecard with 25 SL avatar names (a different one for each item) to Cerulean Vesperia will win a prize of L$1000! You can learn more and participate.’ For more information, contact Beth Gallaway via email, or’ Cerulean Vesperia in Second Life. Beth Gallaway was named a Library Journal Mover & Shaker in 2006 for her work in advocating for videogames in libraries. She is an independent library trainer/consultant specializing in gaming, technology, and youth services, and is a YALSA certified Serving the Underserved (SUS) trainer. Tagged midwinter, Second Life, tech playground, Technology, Virtual Worlds.